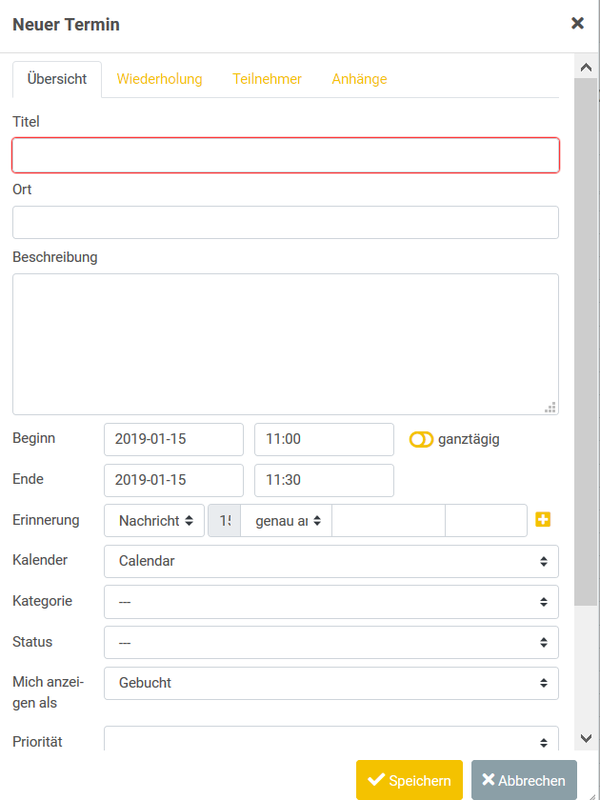 When trying to create an event, and create an event with the option "genau am" the search field itself as well as the greyed time filed before are cut off. Actual result: the words are cut off. Expected result: you can still read the option "genau am" you chose. I used acer (Windows 10) and Firefox 64.0.2. When using the english version, the problem cannot be reproduced. When adapting the size of the open window by increasing it, I can read the entire description. 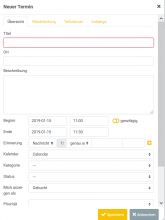 But when opening the "create an event" window the resolution of the opening interface and creating an reminder with "genau am" it can not be read again. So I would have to edit it manually everytime. @M.Gruber what are you trying to say? With the automatic resolution of the opening interface I can not read the description "genau am" when trying to create a reminder to an event. In order to be able to see this description completely I would have to adapt the size of the opening window.